Anyone in Marquette can see that it is definitely Dandelion season again, so I thought today would be perfect for posting a section from My Marquette about what may be Marquette’s most famous home, Dandelion Cottage. 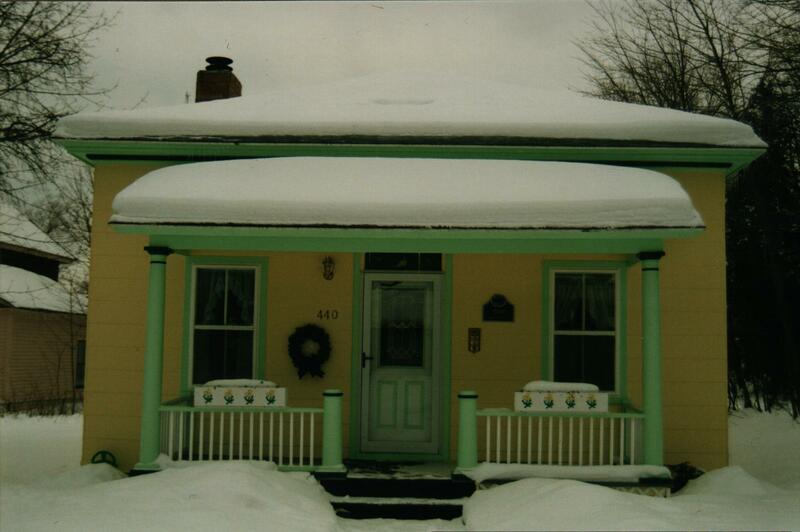 Dandelion Cottage was a real place, and its story is yet another example of how Marquette seeks to preserve its past. No one knows when the cottage was initially built, but Peter White, who owned it as a rental property, donated it in 1888 to St. Paul’s with the understanding that it would be moved from its original home on High Street, a couple of hundred feet north to 212 E. Arch Street, behind the church. White had it moved to make room to build the Morgan Memorial Chapel. The cottage would remain at its second location for 103 years and soon become famous. In 1904, the house became known as “Dandelion Cottage” after Carroll Watson Rankin wrote her children’s book of the same name with the cottage at its center. The story is a fictional account of four girls, loosely based on Mrs. Rankin’s daughters and their friends. 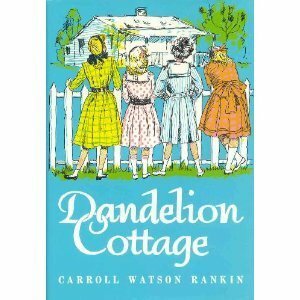 The characters, Bettie, Jeanie, Mabel, and Marjory, earn the right to use the cottage as their playhouse for the summer in exchange for picking the dandelions from the cottage’s lawn. Although the girl’s antics and adventures are largely fictional, dandelions were a problem in early Marquette. John M. Longyear recalled a contest held to see which child could collect the most dandelions in Marquette, but the contest, despite its popularity, and three-thousand, five hundred bushels of dandelions being collected, did not rid the city of its weeds. Another possible real-life source is the character of Mr. Black, rumored to be a fictional portrait of Peter White. expand its parking lot and Dandelion Cottage and the other small house beside it were in the way. sought someone to buy it for the sum of $1.00 and then move it. The church did not give up easily, and after three years, in early 1991, Mayor William Birch and his wife Sally came forward to purchase and move the cottage. On October 12, 1991, the cottage was moved to its present location, which was directly behind the Birchs’ Ridge Street home. given a beautiful restoration. It was repainted yellow, remodeled inside with a modern kitchen, woodwork was replaced and where possible replicated to match the original hardwood; the maple floors were refinished, and dandelions stenciled on the walls. In all, the restoration cost over $60,000, but William and Sally Birch understood that if a thing is worth doing, it is worth doing well. Soon after, Phyllis Rankin, the then ninety-seven year old daughter of the author, suggested a state historical marker be sought which today appears on the cottage. The cottage has since been resold and continues as a residence. Visitors to Marquette make a point to seek it out, and customer reviews at Amazon reveal that Dandelion Cottage remains a favorite among readers, and the Marquette County History Museum sells numerous copies of the book each year. What appears as a weed can turn out to be a gift to future generations. Do you love to write? Take a weekend to hone your craft, connect with other writers, and get inspired at a beautiful location—Camp Michigamme, located about forty-five minutes west of Marquette, MI. 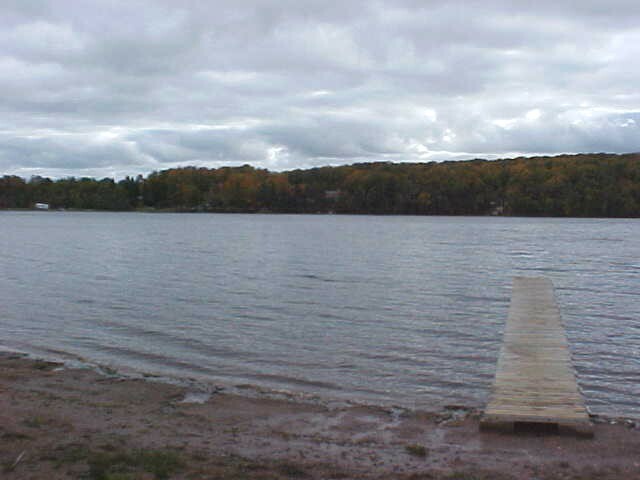 While it is primarily a summer camp for youth programs, Michigamme also provides camping experiences and weekend retreats for adults. At the June 10 – 12 writing retreat, participants will have the opportunity to make connections and gain insight into different aspects of writing from speakers, activities, and other participants. We will focus on how to share your faith and touch lives through your writing. Open to adult writers of all levels and genres. Cost to attend the weekend is $105. Meals will be provided for us by the camp staff, and we will have the chance to relive those childhood camp experiences by bunking in cabins with other writers. We will delve into God’s word and how it relates to our own written words with devotions from the book Write His Answer by Marlene Bagnull. We will also hear from experts on various aspects of writing. Scheduled presenters include Donna Winters (author of the Great Lakes Romances® Series), who will be sharing her experiences with both traditional and self publishing and Tyler Tichelaar (founder of Marquette Fiction and author of The Marquette Trilogy), a specialist in regional fiction writing. For more information or to register, please visit Camp Michigamme’s web site at www.campmichigamme.org. If you have any questions, feel free to contact the camp dean, Jenifer Brady, at jjabrady@gmail.com. 3:00 – 5:30 afternoon free time; some ideas to spend your afternoon include working on your own writing; trying some fun prompts; walking around camp and finding inspiration in its beauty; continuing discussion with other writers who you have connected with; studying your Bible and Write His Answer devotions. Church down the road begins at 11:00 and loves to have campers attend (it is Methodist). Feel free to attend this church or depart from camp when necessary to reach your home church. *The session/presentations will be presented by Donna Winters, Tyler Tichelaar, and myself. Topics will center around self publishing versus traditional publishing, writing regional fiction, and creating an author web site. **Evening program will depend on how many people attend and what types of writing and interests we have represented. I will be sending out a short questionnaire about your writing and interests to participants to be emailed back to me so that I can better cater this part of the weekend to the types of writers who will be attending. Come to the 13th Annual U.P. Publishers and Authors Conference! On Saturday I will be the Master of Ceremonies as President, for the 13th Annual UP Publishers and Authors Conference. It’s not too late to sign up. Here are all the details! MARQUETTE, Mich. (April 6, 2011) – In its constant commitment to keeping regional authors and publishers up-to-date on changes in the publishing world and providing effective marketing and writing strategies, the Upper Peninsula Publishers & Authors Association (UPPAA) will hold its 13th Annual Conference on May 21st in Marquette at the Peter White Public Library beginning at 10:00 a.m. 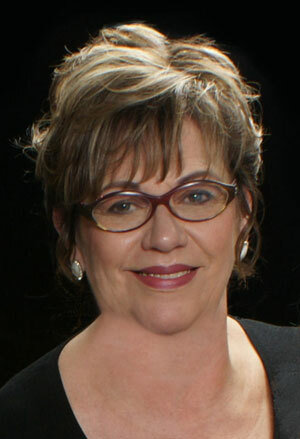 This year’s keynote speaker will be Irene Watson of Reader Views in Austin, TX. Watson is the managing editor of Reader Views, an online book review and publicity service. Watson is also the co-host of the Authors Access radio show and co-author of the book “Authors Access: 30 Success Secrets for Authors and Publishers.” Watson also is author of the award-winning book “The Sitting Swing: Finding Wisdom to Know the Difference.” Watson’s keynote speech will be about how authors can find and identify their audience. Watson will also present afternoon sessions on creating a marketing platform and blogging. This year’s conference offers several additional sessions on a wide range of topics in the publishing industry. Workshop topics and speakers this year include Larry Alexander, owner of Storyteller’s Friend, who will present “Authors Online: Why You Need A Website And How To Get One,” Kristy Basolo and Carrie Usher of “Marquette Monthly” will present “How to Work with the Media for Publicity,” Cheryl Corey of McNaughton-Gunn Printers and Stacey Willey of Globe Printing will present “The Basics of Self-Publishing,” and John French, local artist and illustrator, will lead a discussion on writing and publishing children’s books. A business meeting and the election of a new board will also be held. And a giveaway drawing will result in several book publicity packages, books, and other items possible to be won. The general public may attend the meeting for a $10 registration fee, while UPPAA members can attend free of charge. As space is limited, advanced registration is recommended. Annual membership dues are $25 for individual membership and $35 for family membership (all memberships include the quarterly print newsletter, online discussion group, semiannual meetings, and discounts on dues to two national publishing organizations). A catered deli lunch is available for $8 per person with advance reservations required. Those interested in registering for the meeting and/or joining UPPAA can get more information online at http://www.UPPAA.org/ or by contacting membership secretary Cheryl Corey at 9001 N. Pheasant Ridge Dr., Saline, MI 48176 (734) 429-8757. Registrations online or by mail must be received no later than May 18. Established to support authors and publishers who live in or write about Michigan’s Upper Peninsula, UPPAA is a Michigan nonprofit association with over 60 members. Over 100 member books are posted on the UPPAA website. UPPAA encourages everyone with an interest in writing and publishing books to join and participate. Today, I was honored to receive the Barb Kelly Historical Preservation Award from the Marquette Beautification and Restoration Committee. Congratulations to all the award recipients and to the MBRC for its continued wonderful work to this community. Barb Kelly herself presented the award to me and said some very nice things about me and My Marquette, so here is a little bit about her and her wonderful house, taken from My Marquette.Note that since this photo was taken, the Kellys have begun constructing a three story tower on the east side of the house. C.F. 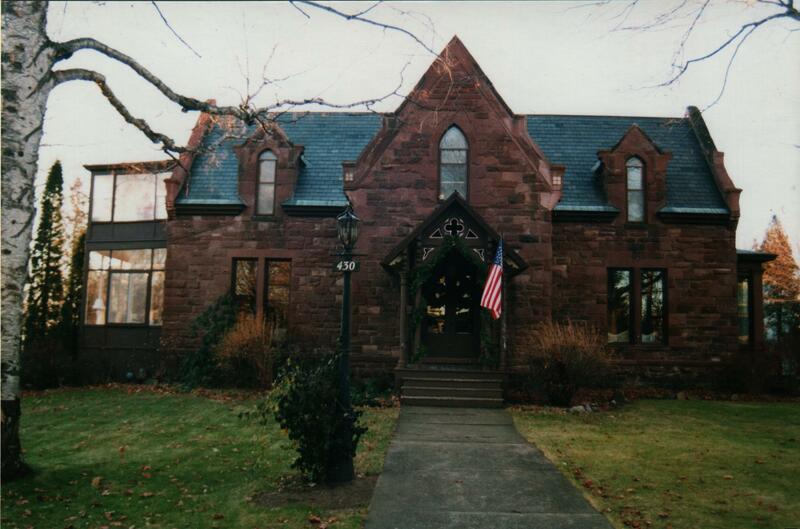 Struck built this fine sandstone home in 1875 for A.A. Ripka, a mining investor. The house features an arched portico, gabled dormers with pointed arch windows, and a steeply pitched Lake Superior slate roof. Not long after its construction, the house was sold to Alfred Swineford, owner of The Mining Journal. Swineford would later build the house at 424 Cedar Street, and give this Arch Street home to his daughter Nellie Flower and her husband Edward Stafford when they married in 1884. When Swineford moved to Alaska, the Staffords remained in Marquette, and in 1890, their only child, Ruth, was born. In 1917, Ruth would marry Roscoe Conkling Main, the county health officer for Marquette County. Later, the Main family would move to California. Today the home belongs to Dr. Peter and Barbara Kelly. Dr. Kelly was among the preservers of the Savings Bank Building downtown and Barbara Kelly is well known for over thirty years of dedication to the Marquette Beautification committee, landscaping and planting flowers throughout the city. The Barbara H. Kelly Historic Preservation Award is named in her honor and regularly given to those who preserve and restore historic architecture and promote historical preservation in Marquette. 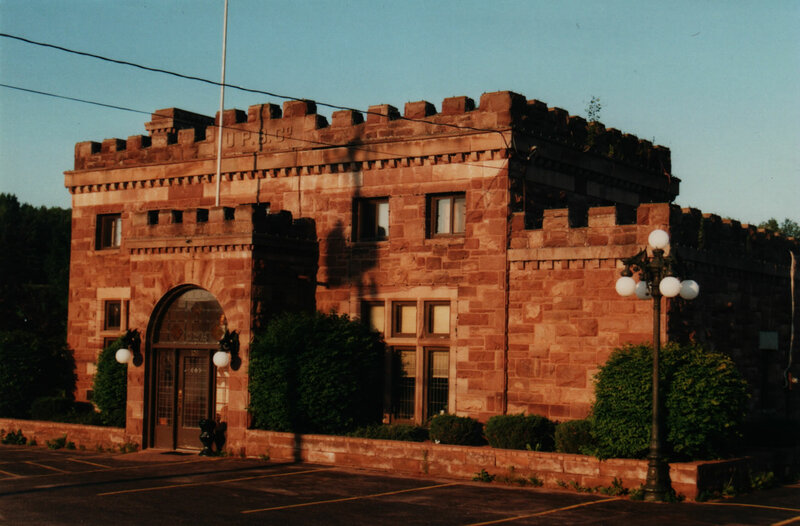 The Castle Brewery, built by George Rublein, one of the first residents of Marquette, does not feature in any of my novels. I had initially planned to set a scene in Iron Pioneersthere but later cut it out. Nevertheless, the building has struck a chord with me from early childhood because of my love for castles. Today I find the brewery’s history interesting because Rublein, like Fritz Bergmann in Iron Pioneers, was one of the German immigrants who came to Marquette in 1849 from Milwaukee. He and his wife Catherine were probably among those who suffered from the initial typhoid outbreak that summer and later in December started walking back to Milwaukee so villagers in Worcester (later Marquette) would not starve to death without their winter supplies. Fortunately, the supply ship arrived on Christmas Day and the Germans were called back to the village. Rublein bought 160 acres of land for $1.00 on what became County Road 492. There he built his home, farm, and his beer brewery. He later would expand his business to the west end of Washington Street, building the Castle Brewery, of which a small sandstone portion remains today. Quite far from town at that time, the brewery’s beer gardens would have been a fun excursion out of town for residents. In Iron Pioneers, the scene I did not include in the novel was to center around Karl Bergmann visiting the Castle Brewery as a young man. The visit would make him feel sentimental over his deceased father and inspire him to make his trip to Germany. Although I left out the Castle Brewery, in The Queen City, Karl did go to Germany, and when he returns, he brings home the German pickle Christmas ornament he gives to his sister Kathy. Decades later, John Vandelaare sees the ornament on his grandmother’s Christmas tree and wonders how such a strange ornament came into the family’s possession. Although no one in the family remembers how the pickle was acquired, it serves as a symbol that the past is always with us. My grandmother never really had a pickle ornament—I just thought it an interesting German tradition, and I do have my own Christmas pickle ornament today. But Grandma always had pickles on the table at parties—bread and butter pickles. I buy them all the time—they remind me of her; we all have our comfort foods. 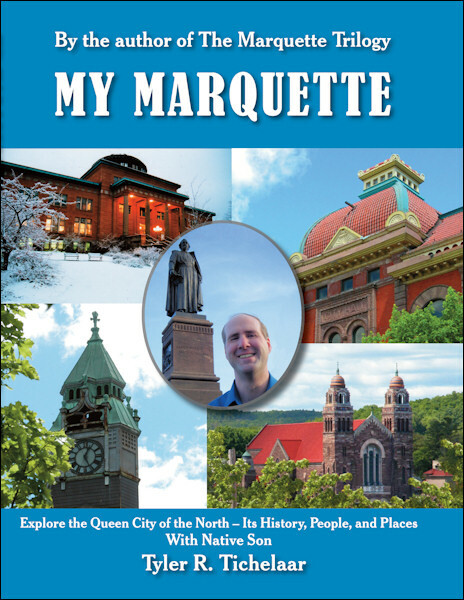 You are currently browsing the MY MARQUETTE weblog archives for May 2011.